How about the 1982-1984 Dodge Rampage front drive mini-pick-up trucks and their 1983 Plymouth Scamp badge-engineered cousins? Here's the 1984 I bought new. It was an excellent little driver with a 2.2 liter 4 cylinder with a 5-speed. Didn't carry a lot of payload, but I hauled a full size couch in it once. Ah Ha! At last an '80s FWD vehicle that is certainly a candidate for being embraced in the future. Nice looking vehicle! Strangely, I don't recall ever seeing one on the road even in Houston during the 1980s. Maybe too early an offering for the market. FWD in general just seems to recall the cars that were downsized and made more generic looking in the 1980's. But personally I don't think actually having FWD has much to do with the issue of future collectibility. Reattas and Allantes would not be any less collected if they were RWD. And something like the downsized FWD 80's DeVilles would not interest collectors any more if they were RWD. FWD ...And something like the downsized FWD 80's DeVilles would not interest collectors any more if they were RWD. The car with the Cadillac name that bore a remarkable resemblance to a Toyota Corolla. Enough to make a Caddy fan puke! 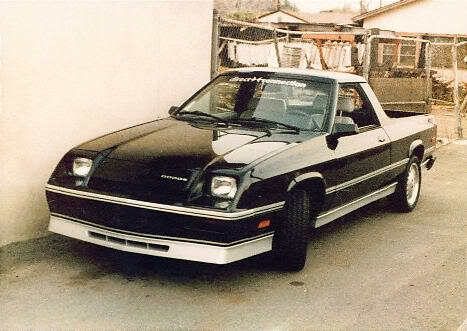 I believe that one problem with the Cimmaron was that it was too much "openly" an upgraded Chevy Cavalier sedan. The Cadillac-level power accesssories were band-aided into the car . . . not unlike what they did with the Opel that became "Catera". The real problem with the Cimmarons was that after they became "trade-ins +2 years", nobody wanted them--period. Not even the dealers! Trade-in value hit $1000 really quickly. Mechanics even refused to work on them, at any price. Kind of a shame, in some respects. IF they could have managed to keep the Chevy 4cyl in it, it might have been different, but much too much "Chevy" would have been there then. The Rampages and Scamps were pretty neat vehicles! With limited seating, you could choose your passengers, just like in a full-size pickup. There were enough of them in DFW to see them a good deal when they were new. Every so often, now, they turn up with "for sale" signs on them up here. To me, they were a much nicer alternative than the small pickups of that era, with about the same level of hauling capacity . . . but with "car-like" comfort. A few related vehicles I thought about today were the Chrysler K-car station wagons. Don't see that many any more, usually driven by older females who might have bought then new or close-to-new and have kept them pretty nice all of these years. Some powertrain upgrades, even a factory turbo motor, along with some chassis upgrades and it'd make a neat sleeper. By the time the K-car chassis got to its half-life, things improved a good deal. The Plymouth Acclaim and Dodge Spirit models (especially the Spirit R/T with the Lotus 16V cylinder head!!!) were nice cars. The Chrysler 600 sedans were pretty nice for their time, too. Can't forget the factory-built Chrysler Executive Limousines!!!! But the one I thought of today was the Chrysler LeBaron coupe. It was a nicely-styled 2-dr coupe (which meets many peoples' "collectible" status. It's more basic version could have a nice interior, 4 cyl, 5-speed, and some tire/wheel upgrades. A "right-size" car with all of the basic attributes of a good commuter car or a nice car for more frugal owners. For a more sporty orientation, there were the fwd Dodge Daytona (and similar Chrysler variation) coupes with turbos, electronics, and other things "upscale" and "performance" for those earlier times. By modern standards, they might be tacky and outdated, but when they were new, they were pretty significant. For those that wanted more power under the hood, there was the Forward Motion group with modified parts and such, too. In the performance orientation, there was also the Dodge Neon ACR sedan. "ACR" = American Club Racer, which was a race series or something back then for stock production vehicles. The Neon ACR was a 4-dr sedan with the upgraded engine, upgraded engine controller (with the top speed limiter removed, as it had Z-rated tires from the factory), upgraded suspension, race-oriented suspension calibrations and tires, and a minimum of other equipment (a/c was restricted from it for the first few years). Finding one of these cars in "nice" condition might be a trick, though . . . like finding a Buick GN that's totally "unmolested". It was that when it debuted but by 1983 sadly, it was a Cadillac. There are Cadillac badges all over those cars and a Cadillac script as well. That makes it a Cadillac even though it really was a Chevy under all that glitz. People forget now that the Cimmaron sold fairly well at first. There were a lot of them on the road in their time. Because it was an entry level car tarted up to justify a 12K price point, it had to have been profitable for GM to peddle this dog. I once owned a 1986 Sedan DeVille. At the time, this car was an improvement over the behemoths it replaced. A 1984 5000 pound Cadillac with a 4.1 Liter V-8 was one of the stinkers of all time. The FWD version was a much neater, better handling, nimbler package in comparison. Thankfully, I didn't own it long enough for the HT 4100 to self destruct. In their time, they sold in large numbers. GM would love to sell as many Caddies today as they did in 1986. I admit that these cars now have no following whatsoever. I am sure that any that are left have become quite troublesome. If there was any car that Cadillac should have been ashamed of, it was the Allante. I had a 1987 that I bought when it was about 5 years old. That car barely had enough reliability to make it to the next stoplight. There was never a day that I owned that car that every part was functional. I used to get it repaired by the dealer, pay the bill, and wait to see what would break on the way home. When I finally unloaded it on the next fool, I never missed it, not once, not even for a second. Cimmaron first year sales were off a third of what Cadillac had anticipated at only 25,968 units and the last year of production, 1988 saw only 6,454 units. A wolf in sheep's clothing amongst a flock of sheep is still a wolf. Just ask the people who were reimbursed after buying their Oldsmobile and finding out their merry Olds had a Chevy engine instead of a Rocket V-8. In Cimmaron's case it was nearly the whole car....but as said before Cadillac people were instructed to say the car was technically NOT a Cadillac. Wikipedia, though not always 100% right, Says that nearly 3/4 of early purchasers of the cimarron had never owned a Cadillac before and that it helped broaden their market because a large percentage of the folks that bought one were under 50, and those were big parts of their goals with this car. Also that it was possibly the basis for the CTS. It's not a hideous car...it's an 80's car. Why does Cadillac have to be stuck in the V8 category to be accepted? Why wouldn't 'mistake cars' be the ones that turn out collectable? If one of the U.S. mints makes a mistake, like crooked cut bills or mis-stamped coins, they're highly sought after. It's that way for a lot of things people collect of value...I don't think I've ever seen one of these cars on the road before, at least that I remember, and that makes it (though a plain-jane car) unique to me. I do not think the Cimarron itself was a mistake. Just the way it was done. At the time BMW 3 Series 2 doors were at the height of their popularity with yuppies. The Cavalier was available in 2 door, 4 door, and convertible. Yet Cimarron was only offered as a 4 door. I think they should have offered all 3 body styles and really focused on the 2 door as a 3 Series 2 door fighter. If they would have given it a little more distinctive sheetmetal (as they did with the first gen Seville), and offered a high performance V-6 and suspension from the start, I think they would have been much better off than offering a 4 door 4 cylinder that appealed to neither traditional Cadillac buyer nor European car buyers. A high performance BMW fighter would have been a lot better image booster for Cadillac (which was getting a grandpa image at the time) than the overpriced econobox they built. How is that any different than "Riviera by Buick"? Are Rivieras not really Buicks then? This was also used by Cadillac for the Eldorado's and Seville - it is funny how the same phrase can be used to raise a model up on a pedestal to make stand out as special and then in reverse used to separate a model they are not sure they want associated with a marque. Re: Cimmaron Don't forget, too, that when it appeared was at a time when fuel efficiency was a prime issue for purchasers AND the corporations as they sought to get all of the CAFE numbers they could. The Cimmaron fit into that situation such that ALL GM carlines had an economical (in reality and perception) vehicle for sale. BUT it needed more distinctively-Cadillac sheet metal on it as once you removed the Cadillac-specific items, you had a pretty recognizable Cavalier under the King's coat. The one thing was the V-6 engine, which was easily recognizable as "Chevy". The whole car was done "on a shoestring" budget, it appears, which is ALL GM could afford at the time . . . one of the indicators of their poor economic health in those earlier times. Personally, when the first '80s fwd C-cars hit, I thought they were pretty nice cars. It was one of the first GM cars to have a "multi-plex" wiring harness where the various computers and sensors talked to each other on common lines at different frequencies and such . . . like a DSL line on an existing phone line . . . just add a frequency filter. This was groundbreaking tech at the time and allowed for simpler harnesses . . . a tech which had evolved from there. To me, the styling of the fwd DeVilles was appropriate and classy. They were wider than the similar Chrysler products,which was another plus for them. Possibly what some seem to not realize is that they were some of the last Cadillacs which were still Cadillac when they were designed. They hadn't been evolved into some sort of "Euro Luxury" car, but were still AMERICAN LUXURY in all aspects. They were also the only C-car with a V-8 engine, which was an image thing back then. The later-gen aluminum V-8s (another status thing) were much better engines. It should also be remembered that those were "jug" engines where the cylinder assembly was replaceable as a unit, if needed. By the end, they were up to 5.0L and had decent power ratings and performance. They were followed by the NorthStar V-8 and its much more complex and complicated "build", which obviously cost GM LOTS of money in labor and parts to produce. Sad thing is that the front wheels didn't know they had all of that hi-tech NorthStar power turning them, just that something was doing it. At that time, Lexus was the benchmark vehicle and if Lexus had something, Cadillac and others had to also . . . didn't matter if it was a good thing, they had to follow the perceived leader, which they did, thereby handing Lexus what Lexus was after in the USA car market (for which it was designed) . . . sales, status, and prestige. To me, the Lexus-ized DeVilles are NOT nearly as good in design and esthetics as the earlier fwd Cadillacs . . . with their "sculptured potatoe" shape that's allegedly needed for proper EPA fuel economy numbers, which also has seemed to become "the standard" everybody strives for in more current times. Much less the stark decrease in brightwork ornamentation that's allegedly done to shoe the precise assembly and panel gap alignment rather than the real cost-cutting exercise (parts, labor, etc) it's a part of! Worst thing I don't like about the fwd DeVilles is the particular font set they used for the instrument panel. Looks a little plain, but certainly an open font that's easy to read. Kind of "underplayed" of sorts, but too much so. There are still some of these cars around, in nice condition. They are DISTINCTLY CADILLAC unlike the newer potatoes with Cadillac grilles or the popular SUVs with Cadillac grilles and amenities. The Escalades are really quite well-done vehicles! As is the CTS, too! SRX seems too small, which also reflects the size of the door opennings. Personally, if I was a Cadillac person, I'd be after one of the fwd later '80s pre-NorthStar DeVilles. Uniquely-Cadillac styling. Good highway fuel economy. Good performance. Cadillac STYLE interior in colors other than "beige/tan" or "graphite", too!!! I'd add some stiffer struts and find some nicer whitewall tires (at 14", VERY ECONOMICAL to purchase 14" tires!!!). Doesn't take 7 quarts of oil for an oil/filter change!!!! As they might say . . . "The LAST of the breed". While there will always be people that don't like anything new, previously each new car year was supposed to bring out better new cars. I recall a little flack about GM's downsizing in 1977, but overall it was the right thing to do, and they were received well enough, especially after the 1980 facelift. However the second round in 1985-6 was definitely a wrong move. I do not recall anyone who bought the 1984 and older versions having anything positive to say about the post '85's. GM was already offering enough small and mid-size cars. Downsizing the full size Cadillac, Buick, and Olds, and Eldorado, Riviera, and Toronado a second time was definitely a bad move, especially with such look-alike styling to each other and lower end models. These were bought by people that liked full size cars and especially the Eldo and sisters were meant to convey prestige. These were very popular cars where I lived, and I can't recall anyone being happy about the second downsizing. I think GM lost a lot of customers with these cars. People were not happy that they had to "downgrade" to a Chevy to get a full size car if they didn't want or couldn't afford a Cadillac Brougham. They didn't like the idea of switching to Mercury for a Grand Marquis either if they always bought GM's, but many did during that time. Many that did end up buying the downsized cars swore they would never buy another GM again. Maybe I will end up like the old farts that holler anything after 1930, 1942, etc, is just used junk. For me the year is generally 1984 as I lost all respect for GM when they brought these out. And while they have produced a few interesting cars since then, I don't think they have ever returned to their pre-1985 glory. What is good or bad certainly depends on one's individual views. I have read the posts concerning those who might be resoldering circuit boards, but I have to believe there are simply too many sealed gadgets on the later vehicles to restore them, regardless of how good they are. I junked one Ford Aerostar because of an electronic/smog component that is simply unavailable, and not rebuildable; and I have some very good sources. I have another 1996 which the cruise control is inoperable because the instrument panel has an issue that confuses the speed circuit in the cruise control. Way too many interconnections. Even with all of the factory circuit books (which I was able to obtain), just no way around some of the electronics. And I get at least one call/week needing an idle speed solenoid for some Chrysler model in the 1970's. Several different, and I am currently unaware any are being reproduced. What you refer to encountering is very common among vehicles of the late 1980s and up. And by the way the lack of parts support for that Chrysler idle speed solenoid, also known in some circles as an idle stop solenoid, is not unique. The same parts problem exists for Fords of the same era. About that 1996 vehicle with the cruise control issue, is that a Ford? If so, try replacing the switch on top of the master cylinder. The problem may go away. The whole speed control setup on mid 1990s Ford truck products was about as stupid as one can get, no logical reason for any aspect of it. Just wait for the air bag light to start flashing. The module is no longer available but you can get around it by doing a board level repair replacing the thermal resistor that has burned out. I remember I didn't care much for the downsizing of GM full sized cars in '77. They eventually grew on me but the 2nd downsize left me completely unimpressed. These cars appeared to be grossly out of proportion and downright ugly. The downsized Eldorados, Toronado and Rivieras of '79 were ugly and never grew on me as the RWD cars did and the 2nd downsizing looked even worse. Last year I wanted to buy a "late" model RWD GM for a daily driver but could not find any in decent shape or weren't lowered with hydraulics. I settled for a retired Crown Victoria Police Interceptor that miraculously escaped the abuse these cars usually receive. I've been fairly happy with the car so far but I do see potential issues down the line from crucial operating components that Ford likes to budget engineer and leave consumers holding the bag. If these common issues do surface, I'll probably resort to a Japanese appliance type of car and join the rest of the bored commuters. A bit off topic but take a hard look at the Chrysler 300 and the Hyundai Genesis. The latter is a U.S. designed and built vehicle. I agree that the 1985 downsize and switch to FWD alienated some people from BOP. I'd give GM until 1987 for the G bodies. Those are always going to be more popular than the full size cars. When the downsized '77 Caprices came online, they sold well and we had many happy customers. Only "glitches" were when one purchaser bought one, loved it, their neighbor/friend bought one but it didn't shift as smoothly as the first one did. That was when GM went to an option code meaning "automatic transmission" rather than a particular automatic transmission. The "good" one had the THM350 in it, the "other" one had the THM200" in it, all with the "MX0 Automatic Transmission" order code. Later, there were "skips" which tune-up techs couldn't get rid of . . . as it was the lockup torque converter doing its thing, but it felt like an "intermittent miss" in the engine, so it went to the driveability techs. The customers weren't prepared for it AND the service advisors didn't have the product knowledge to explain it to customers . . . all for a 3% improvement in highway fuel economy. At that time, the Chrysler lockup torque converters generally locked up at 27mph, later raised to 47mph, but the GMs were modulated by manifold vacuum and road speed. When the fwd Buick Electra Park Avenues came out, I thought they were neat cars. I advocated a friend look at one and he ended up buying it. He later took it on a trip into the midwest and raved about how good it was in comfort and fuel economy. These cars and their companion Olds 98 models were equally as nice as any model before them, just smaller. But, to me, the "joke" was the "handling package/sport package" that they had, which was Eagle GT tires, aluminum wheels, and possibly larger sway bars. As if the cars had enough power to really use these things to the fullest. There were some issues with prior GM C-car customers getting into the newer fwd C-cars and realizing there were more changes than they expected. "Strut noise" was a common complaint on the unit-body cars, which their prior body/frame cars didn't have -- that alone accounted for many disgruntled customers AND many TSBs from Buick. Remember, too, that when the "2nd downsizing" cars were on the drawing boards, the early 1980s recession was in full swing. Fuel economy regulations were highly important, too. Until engine tech caught up, all that could be done was to downsize, use more expensive and lighter materials, and make the best of it with an engine that did good to make 200 horsepower. By the time the cars hit the asphalt, things were better, national economy-wise. The next gen Riviera in '88 reflected the more aflluent times when they were on the drawing board. Ways to meet the CAFE requirements and the new crash standards had eased for a while, so money could be spent on engine technology and research. To fully understand sales figures, you have to realize that how many units a particular model or group of models sold might not have anything to do with how good or bad they might have been, but also whether the economy was such that many consumers might have stretched their trade cycle to be an extra year or so longer. Not wanting a continued car payment for a year or so, or needing to put that money somewhere else in their budget. Then, when they did feel the need to trade (more necessary at that time than in prior times), they got the best match for what they wanted, even if it wasn't really what they might have wanted . . . at a higher price than they might have wanted to pay. Then, throw in some "unusual' technology or designs and it's the perfect set-up for "I liked my OLD car better" orientations. Then, when that payment book was used up, they went elsewhere to shop, maybe finding a better dealership experience or somebody who better explained why things were why they were . . . an explanation they could understand, so they ended up with a different model or a different brand than what they had. Be that as it may . . . In the car business, there is NOT the luxury of trying to stay exclusively with models prior to a particular cut-off date. You have to stay current with what's on the showroom floor as time marches on. Existing stock must be sold to make way for the next shippment of vehicles on the way. I don't know how many times I've heard the brake techs complain about "Why didn't they stay with a ______ ABS system, which worked well with few complaints, rather than this ____________ they went to this year!" You would think that an ABS brake system would be pretty cut and dried, but apparently not as GM seemed to want to try everyone in production to check them out . . . at the customer's expense. They paid for that in warranty claims and disgruntled customers. I like older vehicles, even own many, but I also knew that I wanted to have the confidence that when I take one in for service, the techs know what they're looking at. With my 2000 Impala, it's new enough that they know what they're looking at, gets good fuel economy, AND old enough to have been inexpensive enough to pay cash for. And the discussion continues . . .
Back then, remember that when a new model was first considered, it was about 4 years before it would hit the end of the assembly line. As in "completely new" model rather than a "mid-term refresh" or similar. But then one day I realized that GM had 2 or 3 different platform designations, all with wheelbases within a 3" range of each other--max, and they all took different parts! How the heck did that happen??? It was more than holding on to cars an extra year or two for economic reasons. When the Buick Roadmaster came out, there was quite a bit of newspaper coverage about how Buick dealers were shocked to see the high amount of pre 1984 BOP's coming in on trade (some even dating to pre-1976) and even Marquis and Caprices coming in on trade. Their owners simply held onto them waiting for BOP to come out with the type of car they wanted again, or had switched to Marquis or Caprice because they got tired of waiting. While the Caprice and Brougham restyle and Roadmaster were long overdue, they were still not as well received as they should have been. 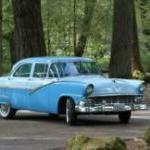 In the 1960's for example, Elvis, Motown stars, young successful people all bought Cadillacs. They changed every few years with trendy styling, offered sportier coupes, convertibles, and high horsepower engines. By the late 1980's, the Brougham had outdated boxy styling, was only a four door, and was not offering any high performance options (eventually the Corvette engine was available, but it was too late, they waited too long). By this time they were considered grandpa cars. So the rounded aero look was too drastic, unlike the 1990 Town Car which managed to combine boxy and aero into a more palatable look for the elderly buyers. Plus the trio were not very well proportioned. The Brougham's grille was too large and the C pillar too small. The Roadmaster's C pillar was too big, and trunk above the taillights too tall. The Caprice was the best proportioned of the three, but even with those buyers complained that the rear looked like it was jacked up. This was resolved by fully opening the rear wheel well, but that left it less interesting looking IMO. Plus all three had ridiculously huge dashes. With these cars now out of favor, Hondas and Toyotas were now considered every bit the equal of the downsized BOP's. This would never have been the case with the full size BOP's in 1975 or even 1977.